Crested Hawk Eagle (CHE) – Bird of Prey: by Kishore, Naturalist in one of India’s famous Tiger Reserve, The Bhadra Tiger Reserve. This article (in the words of a senior naturalist) explains the bird of prey – Crested Hawk Eagle that is found in India in detail, its behavior, physical structures and its hunting capabilities with real pictures taken from Bhadra Tiger Reserve in Karnataka State, Southern part of India. Bhadra Tiger Reserve lies in the Western Ghats, a rich bio-diversity hot spot in India, with rich flora and fauna. 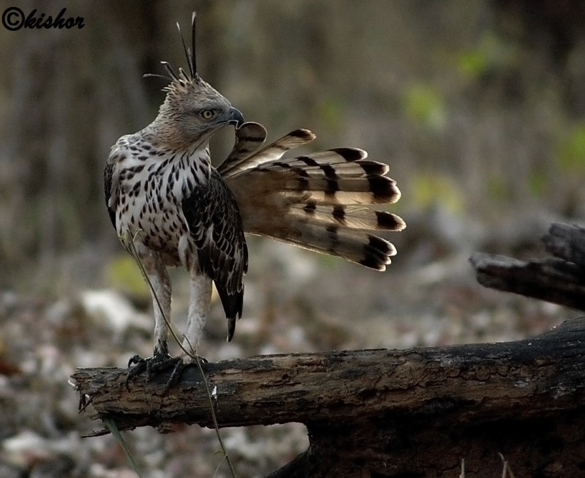 I am very keen on the winged jewels of the forest and one such favorite bird of mine is a “Crested Hawk Eagle”. He is one of the large raptors, with a beautiful crest, sharp talons, acute vision and varied colors. 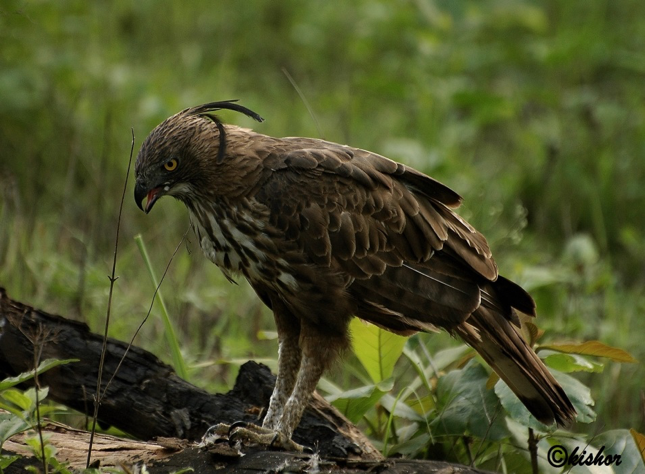 I was fortunate to capture some rare moments of the Crested Hawk Eagle and would love to share it through my blog. I would first like to give a brief description about this beautiful creature. Crested Hawk Eagles are large raptors with varying color morphs. Juvenile has white to buffish head and under part. Adult has brown prominent white tipped black crest, heavy brown streaking from neck to belly and rufous brown belly. Crested Hawk Eagles are found throughout southern and Southeast Asia and in India, Sri Lanka, the Andaman Islands, Philippines, Borneo, and the Indonesian islands Sumatra, Java, and the Greater Sundarbans. 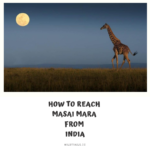 They live in deciduous, semi-evergreen, and logged forest, along with savannah woodland, tea plantations, cultivated regions, and even along the edges of suburban areas. They usually live from 0-1,500 meters above sea level, but are known to occupy habitat as high as 2,200 m. Pairs remain in the same territory all year, although they do not hunt together. They are irruptive or local migrants, and juveniles disperse from their parents’ breeding areas. Most of the breeding is observed during November to May in Southern India. 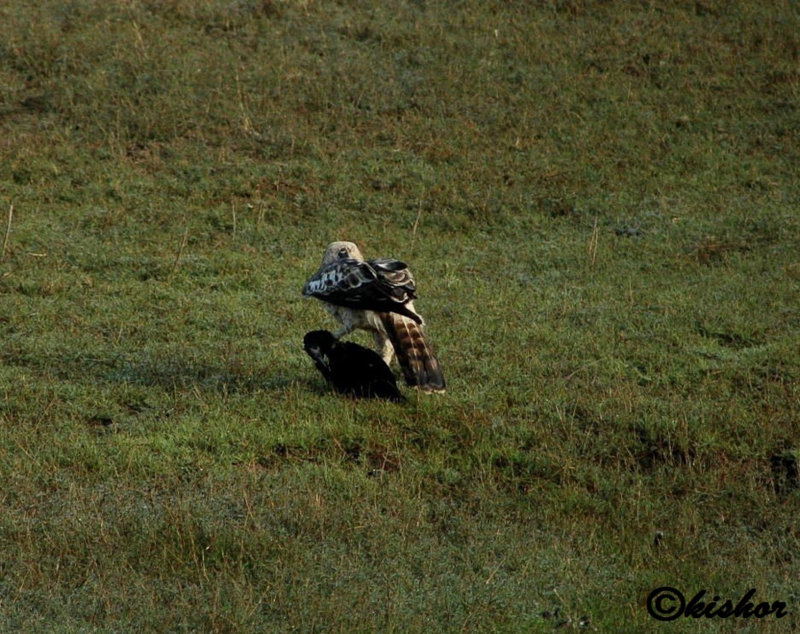 Here is one of the rare moments of the crested hawk eagle feeding on a common crow. Crows are known to be aggressive birds, however on that day; the crested hawk eagle superseded the crow. 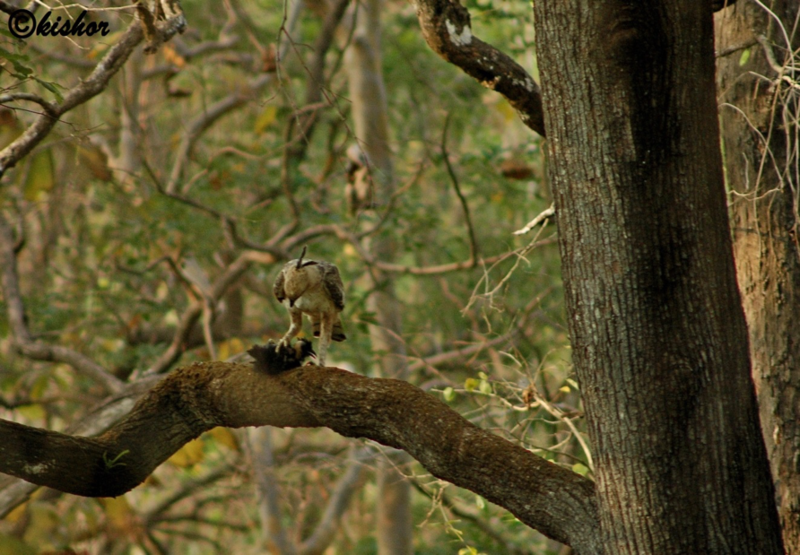 Here is a second example, where the crested hawk eagle is seen grasping a Little Cormorant. Cormorants are both aquatic and terrestrials, while they spend most of their time in water looking for food, they also come out to dry their wings and bask in the sun. Crested Hawk Eagle seized this opportunity and was eventually successful. 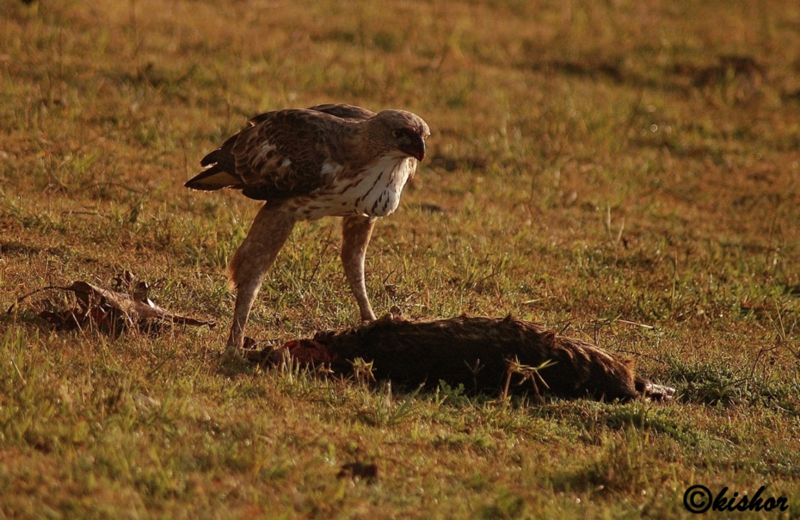 Here we can see the Crested Hawk Eagle butchering a little egret. 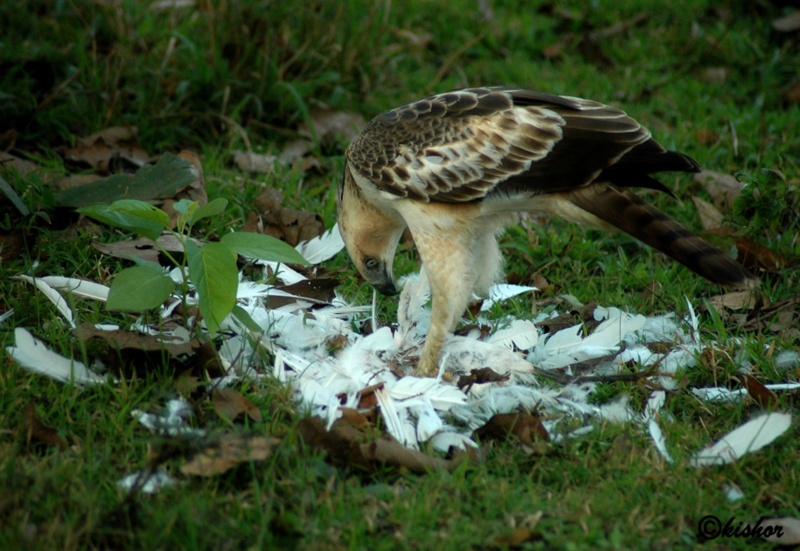 Little egrets are medium sized bird, they are weak fliers so the hawk eagle took a chance of that and killed it and started to feed on it. This is one of the rarest moments to me in the wild. 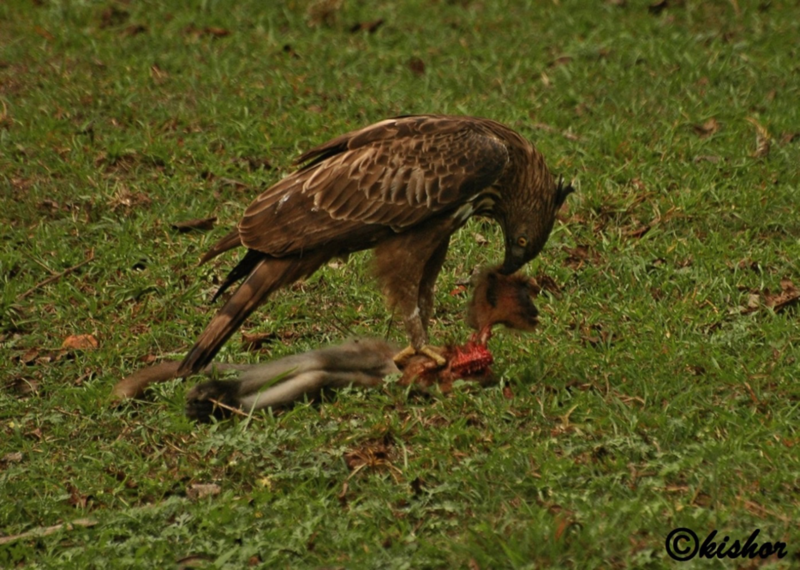 Crested hawk eagle feeding on Mouse deer. Mouse deer is a nocturnal , they more active at night. I had this sighting in morning. Frist we sighted eagle on ground at long distance it was in some moment then we reached near to this eagle then we spotted this mouse deer kill. It was a fresh kill just it was started eating from head you can observe that. Again this eagle is proving its power in the jungle. At this time with langur monkey kill. Langur monkeys are social animals they stay in groups. These monkeys are always more active, they spend most of the time on trees and sometimes will come to the ground. These monkeys got good eye sight if an any Predator’s moments they give warning calls sometimes they get alerted by the warning calls of deer’s, squirrels, and some birds calls and escape to the trees but here is the evidence shows sometimes on tree also will be threat. 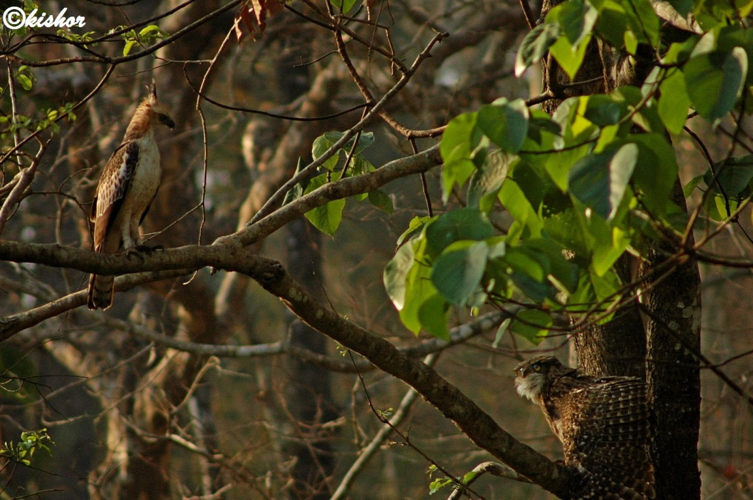 The Hawk eagle showing its power to the Brown fish owl by its terror looks. At first the owl was sitting quietly surprisingly this eagle came and sat next to the owl and started staring, the Owl got scared, then it spreads its wings to show off. When you sight this bird, remember the power of it. 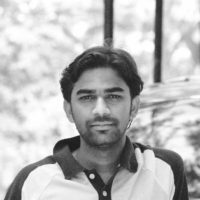 Kishore Venky is a senior Naturalist with Bhadra Tiger Reserve, in the State of Karnataka, located in the southern part of India, approx. 280 kms north west of city of Bangalore. If you need further info on Safari at Kabini without a Stay, or plan a visit to Kabini, and need further info or you want us to help you book safaris with a stay but at budget locations, contact us any time via an email to bhadra@wildtrails.me or call us any time on +918030178142 or WhatsApp us @ +919901175444. Also please do install WildTrails India App or read the below related blogs. 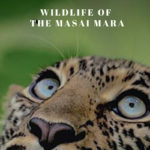 How to get Safari at DammanaKatte Kabini? 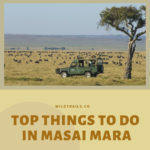 How to do a Safari at Kabini without a Stay?